Trained in lithography and wood engraving, Homer embarked on a career as an illustrator for Harper's Weekly during the Civil War. A trip to France in 1866 and 1867 exposed him to the early work of the Impressionists and sparked his interest in light and color. Homer's first serious use of watercolor may have been precipitated by an important exhibition in New York early in 1873. 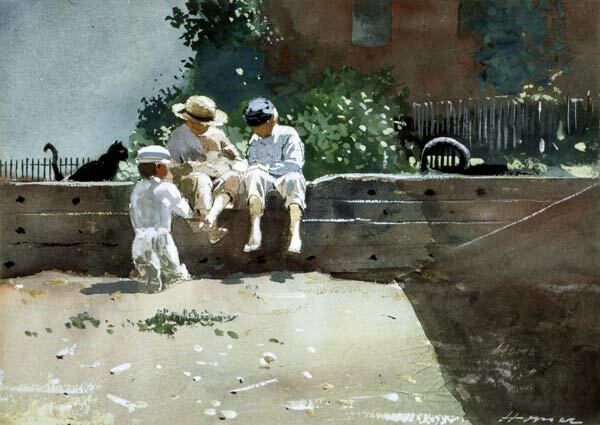 It was during that summer in Gloucester, Massachusetts, that the artist produced a series of small watercolors involving the theme of children playing. The decorative flatness and sharp contrasts of light and shade in Homer's works of this period relate to his ongoing career as a magazine illustrator. In Boys and Kitten liberal application of white gouache, or opaque watercolor, creates dazzling highlights and helps to emphasize the structure of the composition. Employing saturated, opaque color, rather than the transparent washes that were to predominate in his later works, Homer worked from dark to light as he did in oil painting. As a watercolorist, holding the materials of his art in as high esteem as those of oil painting, Homer accorded his subjects a monumentality that raised the level of prestige for that medium.